Region: This Caterpillar is found in eastern and southern United States. Life cycle: This insect produces one to two generations each year. The pupae hibernate in the soil. As with many insects, this caterpillar population goes in cycles. They might be bad for one to two years and then virtually disappear for several seasons. Physical Description: This 2-inch long caterpillar is reddish brown to black with a black head and white hairs. The adult moth also has a hairy body, is brown in color with four dark bands bordered in white and a wingspan of 1 to 2 inches. Feeding characteristics: This pest attacks apple, peach, pecan, and walnut plants by eating the leaves. They will stop eating in the middle of summer to molt, then resume there feeding in the fall. 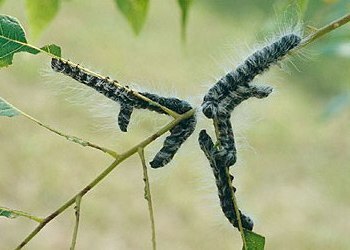 Controls: These caterpillars will congregate at the bases of branches every night making it easy to remove them on small trees. A ladder may be necessary for larger trees. Use a rolled up burlap bag to rub them out during the late evening. If hand destroying is not feasible, spraying with Bacillus thuringiensis or pyrethrum to help control the larvae.